Happy Monday. Hope your weekend was great. 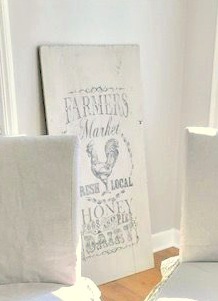 I bought this French Market sign awhile back for the new house. I was not sure if I would have wall space in the new tiny kitchen but I loved it and thought I will some how make this work. This is not the greatest picture but you can see the market sign. It was a dirty gray looking sign. It was screaming making me pretty!!!! I bought a black frame at Hobby Lobby on the clearance and painted it white. It fit perfectly around this sign. Score! After I painted the frame white and put it around the sign it was really looking dirty gray to me. So what I did was get out my trusty white paint and added water to the paint. About 1/4 cup paint to 1/4 cup warm water. Then I took my paint brush wet and dipped it in the paint and painted it over the surface of the sign. I took a wet rag and wiped off the paint. This allowed for the stencil to come through. I did this 3 times to get this white/gray wash look. I like the white wash look to this sign so much better than the dirty gray look. Working on getting the kitchen done to show you soon. 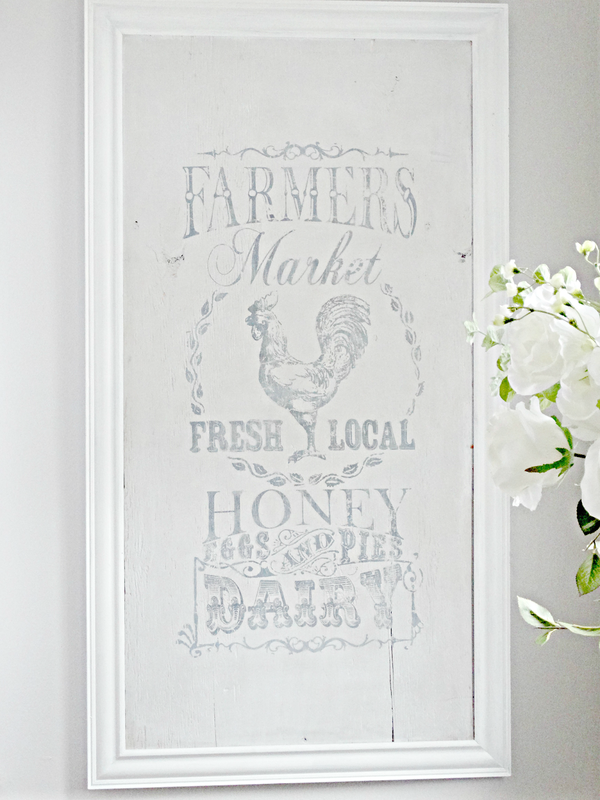 This sign makes a great addition to the kitchen eating area. The sign turned out great, Kris! I love it when you can makeover a piece to make it perfect for your decor! I like the white wash too. Very well done. 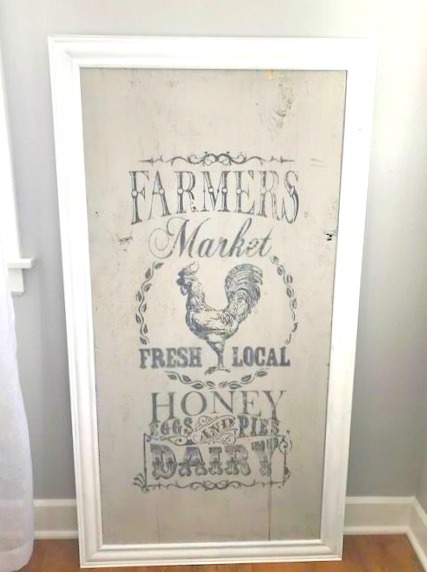 The sign and the matching frame were both great finds, Kris! Good idea to use a bit of white wash. This will be a lovely piece for one of your walls. P.S. we are in for a hard frost tonight...it rough getting used to this new cold weather. Happy Monday, Kris! I would never have thought of a white wash, but I agree the whiter finish is more "You." Love the sign either way. I love the sign! It's funny because I just bought some local honey from my farmer's market! Lol! Just beautiful. What a wonderful transformation. I love the pop it has now. Can't wait to see the kitchen! What a great sign for the kitchen area. The white wash technique worked out great! Super cute. Great idea. I'm so glad that it worked. It's gorgeous! I wish I had the nerve to paint everything like you do. We have furniture pieces that need paint and I'm just a chicken! Soooo much improved!!! I love it, Kris! Looks great, Kris! Great score on the frame. Looks fantastic Kris! The frame and the paint job you did truly made it awesome! Great find for your kitchen. You worked wonders on the sign and it looks terrific. The sign is really beautiful..
Oooo, this is FUN! Watching you put your transformation magic on things, this is what I was waiting for! I don't know if I would've had the nerve to do that whitewashing for fear of ruining the graphics, but you sure demonstrate the "no fear" mantra. It looks great, perfect for your house now. No fear when it comes to this stuff with me. I knew the white wash would let the graphics show through. Just needed to get rid of the dirty gray look and brighten it up some. Happy Tuesday. Have a good week. Kris, I had no idea you could do that...I'm assuming it's fabric? It looks so much better than the dirty grey look before. Can't wait to see your kitchen! Looks so great! I wish we had a Hobby Lobby here! Wow, it sure came out great after you whitewashed it...I'm thinking about white washing the fireplace..Happy Halloween! Hi Kris! Looks amazing. I never would have thought to whitewash the entire picture. Can't wait to see it in your home. Wow, this cleaned up very nicely! you never cease to amaze me! Hi Kris, I really love what you did with the sign and how you painted it and framed it!!! It will look nice in your kitchen and I can't wait to see it. Have a nice week. I can't believe you found the perfect size frame for your french sign, Kris! I like the whitewashed look for your home and I can't wait to see where you hang it. Have a good week! Kris you made it fit perfectly into your aesthetic and I can’t wait to see it hung in your kitchen. such a charming sign! Really looking forward to the kitchen reveal! Kris, you fixed it perfectly! I love how you have transformed your sign to make it your own! Such a neat idea, paint is one of my best friends! Love the sign and frame!...looking forward to seeing the kitchen Kris....have a great week!!! I love it, Kris!! Sorry I've been missing posts, I'm hopping over to check out the living room reveal now! Can't wait!! As usual, you take something nice and give it that extra special touch.